Today is National Poetry Day, and this year’s theme is ‘Remember’. Could there be a better occasion for me to throw in a gratuitous Latin poem from the Carmina Latina Epigraphica? No, I didn’t think so, either. 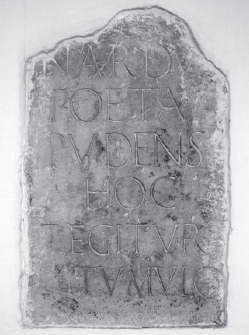 The inscription, of uncertain origin and date (presumably of the first century B. C., however), now kept in Nola, commemorates an otherwise unknown poet called Nardus. At first glance, the text does not appear to be much of a poem: six meagre words, spread out over six lines. Yet, it is a poem – and even as such it is an unusual one, as reductionist as everything else about this stone: it is a monostich, a poem of but a single line, and it is made up of a line that does not normally feature individually in Latin poetry, namely a dactylic pentameter: this rhythm hardly ever occurs without a preceding hexameter line. There is little imagery (except, of course, for the notion of a tomb ‘covering’ the deceased like clothing or a blanket), and there is little play with sound (but note the double use of alliterations in poeta pudens and tegitur tumulo). The infuriating brevity of this poem has inspired scholars for a long time now: who was this Nardus? Should one interpret pudens (‘bashful, shame-faced, modest’) as another part of the poet’s name, and could he then be a Pudens that is already known from other sources? One scholar was even desperate enough to think of a compound noun nardu-poeta, supposedly meaning ‘soap maker’ (nardus is a Graeco-Roman term denoting lavender). In Latin epitaphs, pudens is a quality that praises restraint, moderation, and temperance in moral terms. In a number of cases one finds it accompanied by references to (sexual) chastity (as a female virtue), sometimes accompanied by references to a deeper understanding of the role of temperance and simplicity in life (such as frugi, gender neutral). It might just be the case, then, that Nardus, the poeta pudens, (or his relatives, of course) gave us a poetic example by which he wanted to be remembered, illustrating his being pudens in the single-most reductionist way possible – linguistically, metrically, poetically. And yet, we can remember him and his poem today. This entry was posted in Carmina Epigraphica, Poetry and tagged Carmina Latina Epigraphica. Bookmark the permalink.